TOKYO, Feb. 10, 2019 /PRNewswire/ -- Reed Exhibitions Japan Ltd. will be holding BATTERY JAPAN 2019 - Int'l Rechargeable Battery Expo from Feb. 27 at Tokyo Big Sight, Japan. Along with the spread of renewable energy such as photovoltaic and wind power generation, the demand for rechargeable batteries is rising. Since it becomes key devices even in the automotive field for EV conversion, high function such as high capacity, power output and longevity is more expected. 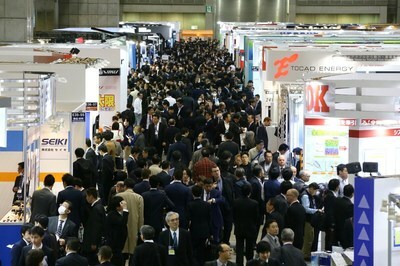 Being a world's leading exhibition & conference for rechargeable battery, BATTERY JAPNAN 2019 will be gathering 330 exhibitors and 70,000 visitors including concurrent shows. Among the impressive number of exhibits and technologies, this year's highlights are "solid-state battery" and "EV development technology". The show will be featuring a large number of products related to the research and development of "solid-state batteries" whose commercialisation is now imminent to serve as next-generation batteries. For example, TANABE CORPORATION introduces a rotary kiln for demonstration test corresponding to a functional powder and TOYO CORPORATION is to present a high-frequency impedance measurement system for evaluating electrolytes. On top of that, KRI presents services for evaluation/analysis of materials and SHIMADZU CORPORATION will be showcasing scanning probe microscope. There is also a wide array of conferences on solid-state batteries. At the technical conference on the theme of "Emerging Next-generation Batteries" on the event's first day, HITACHI ZOSEN will deliver "Development of All-solid-state Battery for Commercialization". Also in the same afternoon, delivered another session entitled "Latest Trends in the Development of All-solid-state Lithium-ion Batteries" by UNIVERSITY of MARYLAND in the U.S. and IDEMITSU KOSAN etc. are to present the latest research achievements. While the development of EV industry is gaining impetus all over the world, in response to such worldwide momentum, the show will be featuring an extensive array of battery materials and inspection equipment for in-vehicle batteries. For example, SEKISUI CHEMICAL will be showcasing laminate type lithium-ion battery that simultaneously realising high safety, longevity and high capacity while SPACELINK will exhibits carbon nanotube for supercapacitor. Besides, lithium hydroxide, leakage inspection equipment using helium, battery tester integrating charging and discharging equipment and inspection equipment are outstandingly showcased at the show. On 27th, LG CHEM and NIO, the automobile related start-up company attracting widespread attention as the Chinese version of Tesla will be presenting a Keynote Session with the theme of "Frontline of the Latest EV & Battery Development in Asia". TOYOTA MOTOR and German Government will deliver another Keynote Session of "Impacts of the Development of Next-generation Batteries and Wider Adoption of EVs" on 28th. With the line-up of various exhibits from Japan and the world and comprehensive conference sessions, BATTERY JAPAN is sure to be an ideal venue to find new business and catch insights of the current industry conditions and outlook. At the same time, the shows will be held within World Smart Energy Week 2019 with 8 other exhibitions specialising in renewable and smart energy such as wind energy, solar power, hydrogen & fuel cell, biomass energy, smart grid and recycling technology for renewable energy. Participants will be able to build business and cross network with a vast range of professionals. Get the Visitor Ticket and update the latest trends in the energy storage industry.